Home > KitchenCraft News > Introducing Boris the spider! Let the build up to the night of fright begin! From ghoulish tricks to spooktacular treats Halloween is definitely a night for consuming so much sugar you go to bed feeling a little sick. 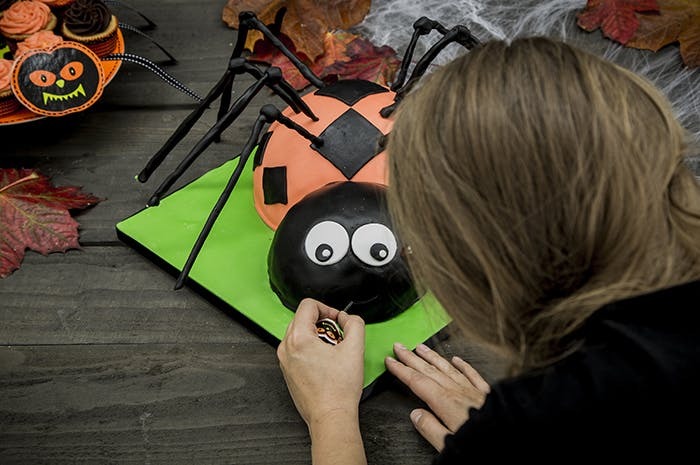 I have being dying to try out our Master Class Silver Anodised Hemisphere Cake Pans for weeks now so thought I would treat the office to a little Halloween surprise, Boris the spider! Boris was far easier to make than I expected and looked super cute, although I’m not sure cute was what I was meant to be achieving. Here’s my step by step guide to creating your own Boris. Both cakes will be made using one mixture. 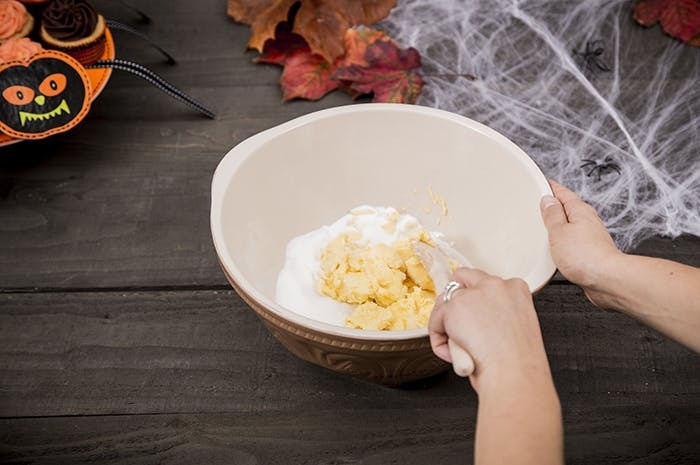 In a large mixing bowl combine your butter and sugar until light and fluffy. 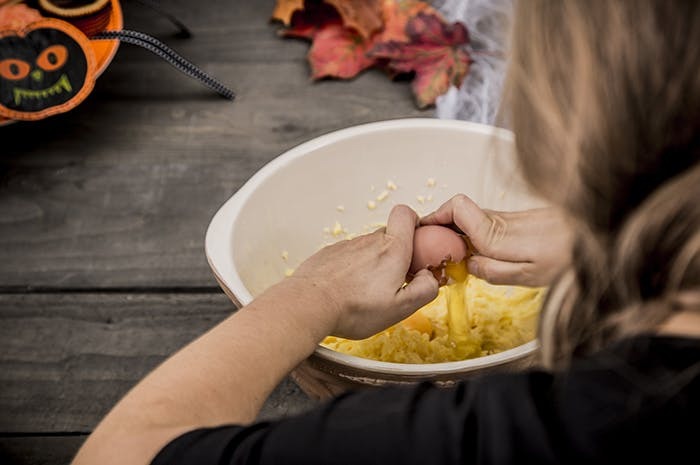 Slowly beat in 4 eggs and add half the flour, once well mixed add the remaining 2 eggs along with the vanilla extract and remaining flour and beat well. Pour the mixture into the tins filling each three quarters full. Bake the small cake for 20-25 minutes and the large for 50-60 minutes. Allow the cakes to cool in the tins and then transfer to a wire tray to cool completely. Once the cakes have cooled you can fill with any filling you desire but I have chosen to use strawberry jam and vanilla butter cream. Again in a large mixing bowl beat the butter until light and fluffy, gradually stirring in the icing sugar and vanilla extract. 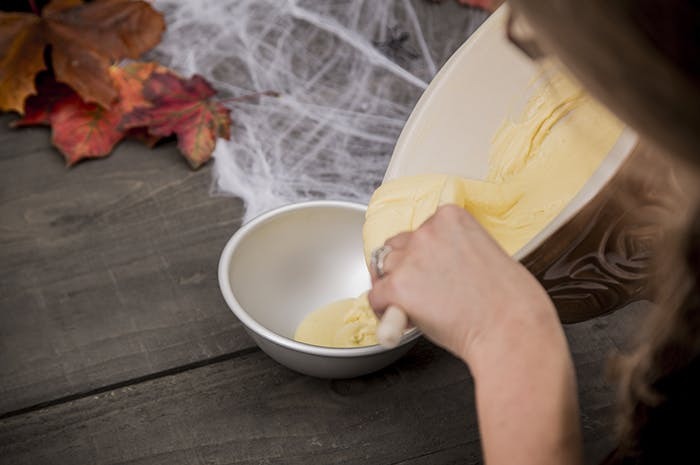 If your mixture is dry add milk until the buttercream is soft and spreadable. Cut your cakes in half and spread jam and buttercream over the bottom half. Replace the top half of the cake. Use the remaining butter cream to cover both cakes. Place the cakes on your cake board. 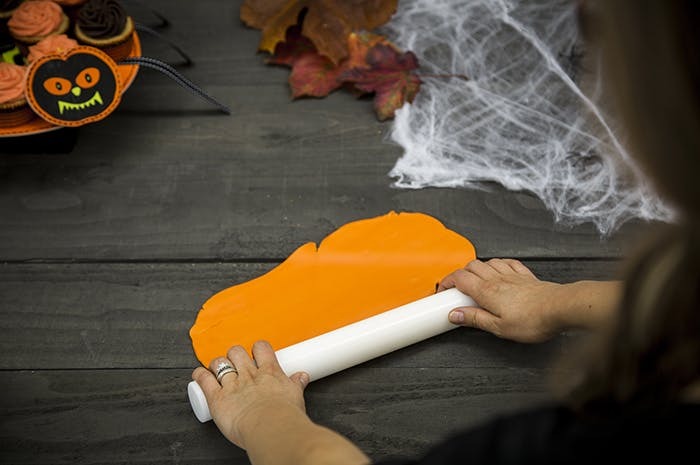 Roll out orange icing to approx. 35cm diameter. Carefully lift the icing and place over the large cake, smooth down using an icing smoother from the top downwards trimming away any excess. Cut off approx. 100g of black icing and roll out to approx. 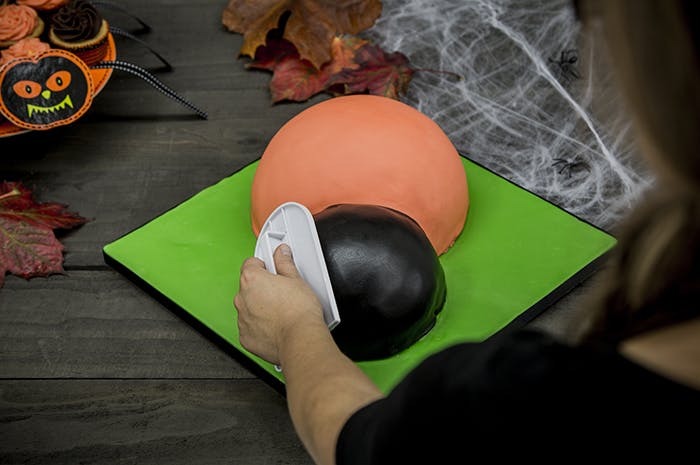 15cm diameter, place over the small cake, smooth down using an icing smoother from the top downwards trimming away any excess. 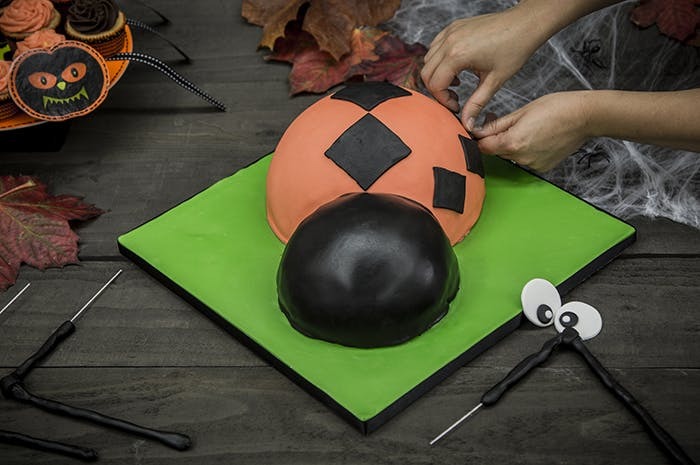 Roll out another 100g black icing, use a small square cookie cutter to cut out 8 squares and a larger cutter to cut out another 4 squares, bush the backs of the squares with a little water and place the smaller squares on the outer side of the spiders body and the larger squares down the centre. Roll out 250g of black icing and cut into 8 strips. Place florist wire in the centre of each strip. Wrap the icing around the wire leaving a small amount of wire exposed at the top. Mould into the shape you require for the legs. 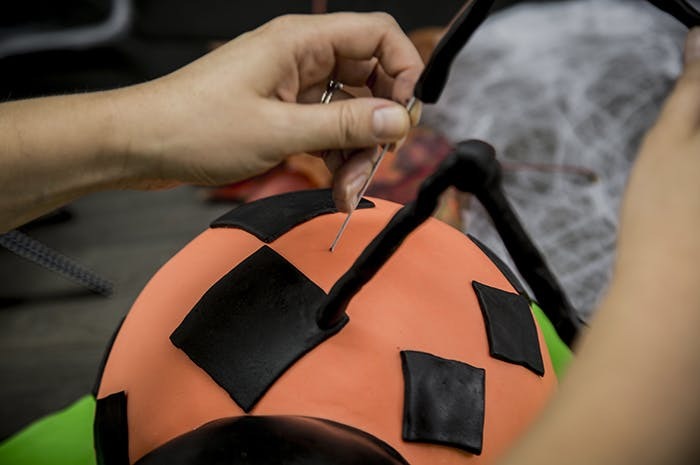 If some wire is showing at the point where the leg bends, place a little more black icing over the top. Insert the legs into the cake at the desired points. 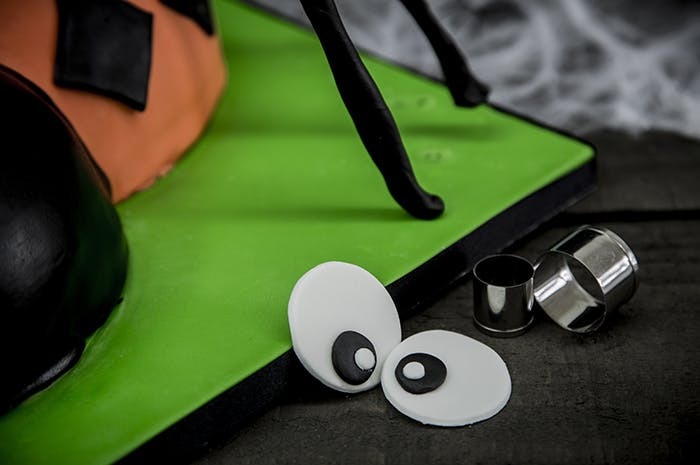 Use two sizes of circular cookie cutters to cut out eyes and as with the squares brush the backs with a little water and press onto the cake. Roll a small piece of icing into two small balls for the pupils. Pipe teeth and fangs onto the spiders face. 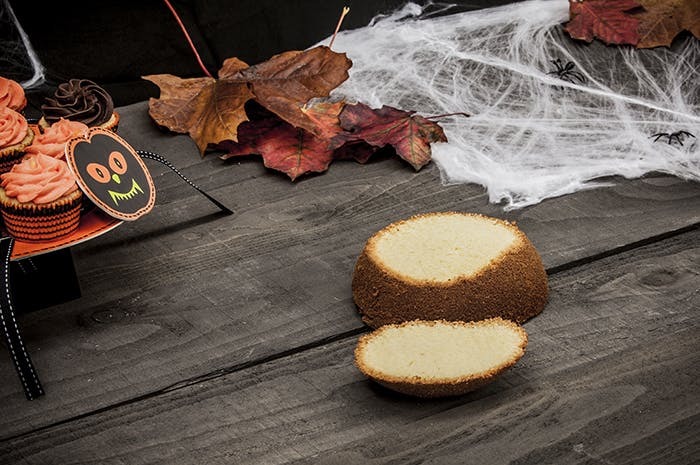 Serve to your hungry little ghosts and goblins.